Today I decided to start a new little project.. As you all know I am OBSESSED with Halloween & have been periodically doing this #HalloweenSeries through out the entire month. However, I have decided / committed to turn this last week of October (sigh) into Halloweek! 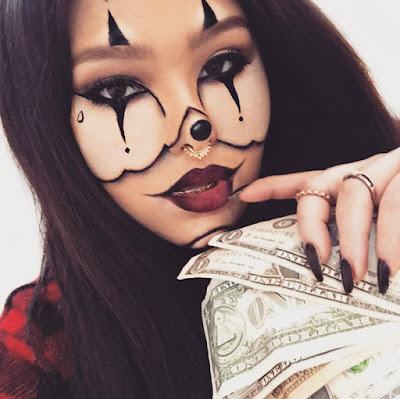 Basically this week will have a new Halloween makeup look up every single day up until October 31st (last one being this Friday) So get ready & be sure to comment below which look you like best!!! Happy Halloweek! The look we are doing today is the "Ganster Clown"
1. Start out by doing your normal face ( foundation - concelar - etc. ) routine. 2. Fill in your brows like normal - I attempted to lighten my brows which was stupid becuase this is like a chola gangster clown so... I would deffenitly go lighter if I were to re do this. Then do a normal eye look with a winged liner. In Chrisspy's look she had a glittery cut crease, but I went for more neutral shades. Then taking a liquid liner you want to extend the inner corner point of your eyeliner down till about half way down your nose. 4. Next grab your black liner. For this whole look I used Skone Cosmetics black tattoo liner pen. Start tracing the outlines you made with that light powder. 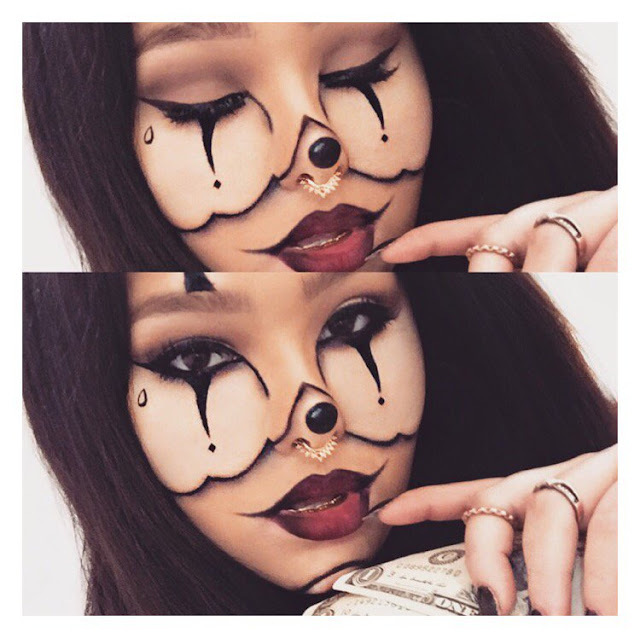 Then start filling in the solid pieces with a black gel liner or a black cream face paint. 5. Next draw on the little diamonds beneath the "tear lines" and then draw a little tear drop on the side of the face. The original Chrisppy look didn't have this, but I could not do a "Gangster" look with out a creepy tear drop tattoo. If you don't know what the tear drop signifies, google it on your own time..
6. Now we need to shade. I used ABH "Nior" shadow for this whole process. Make sure you use a tiny brush and just start smoking out all of the lines we made. This basically makes all of our black lines look like they've been tattooed or carved into our clown face. 7. Draw on a black clown circle to your nose. Fill it in, and then put a small white accent on the top to make it appear more denominational. 8. Take a white / or light highlight powder and fill it in under the eyes to whiten and brighten that area. Then take it around the top points on our forehead, creating subdued white clown looking circles. Also put some white powder inside the circle on our chin. 9. Extend the mouth by using a black khol liner pencil. Take the pencil to the corners of the mouth extending them out and up to give a creepy smile. Then line the rest of the lips with the black pencil, and shade in the sides. Then apply a dark red lipstick or liner to the center of the lips. I used Jordana Cosmetics lip liner in "Cabernet." 10. Apply some creepy black long nails, a septum - mine is from Lotus and Co. In the style "Frida" and a grill to the bottom of your teeth. That's It! 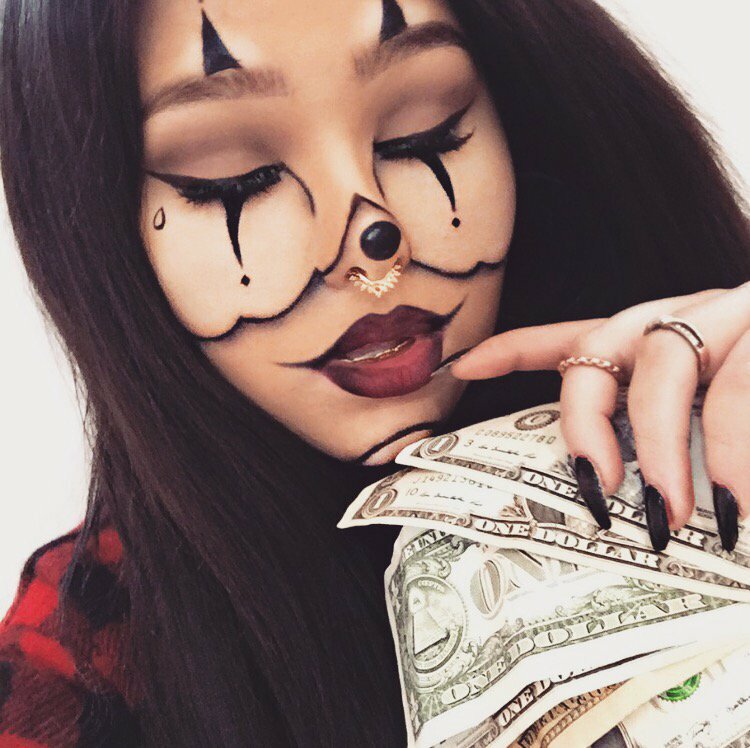 Just put on a red flannel, grab a stack of money and you are good to go!